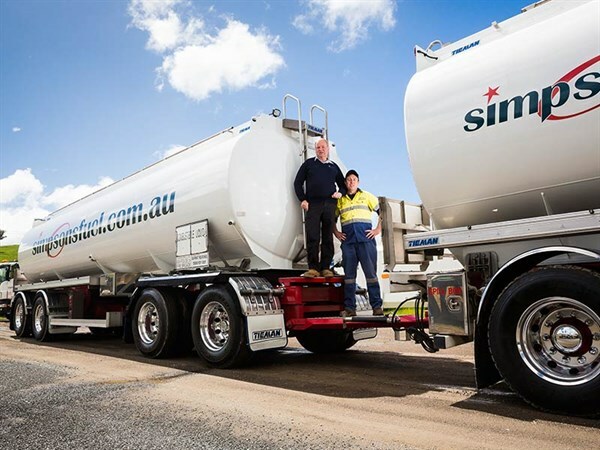 Committed to serving the local community, Alexandra-based Simpsons fuel has been going from strength to strength since its early days as a general freight carrier. Established by Ian Simpson upon migrating from Scotland, the business soon changed track to fuel, providing petrol for Commonwealth Oil Refineries (COR) which later became BP Australia. Simpsons became a fuel distributor for Caltex Australia in 1985 when BP pulled out of country Victoria, seeing its customer base grow to 1200 today. Now run by Ian’s son Gordon and grandson Cameron, the company carries more fuel than ever following last year’s purchase of a performance based standards (PBS) 20m rigid dog and tanker built by trailer manufacturer Tieman Tankers. The 57.7-tonne truck can carry 46,000 litres of diesel on each run – up from 30,000 on a regular semi-trailer. What’s cost $700,000 to build has paid dividends for the Simpsons; they’ve been able to cut down a trip per day to Melbourne, leading to massive cost savings. They were the first to run the tanker after custom-designing it with Tieman. "It took about 12 months to create it and get it on the road," Gordon Simpson says. "We came up with the idea after seeing something similar with tip trucks; we thought there was no reason why we couldn’t do it in the fuel game. "We asked some other trailer manufacturers prior and Collin Tieman was virtually the only one that wanted to take us on as he is a good friend of ours. We knew exactly what we wanted and spent a lot of time on Tieman’s simulator to get it right." Being the first fuel distributor to run a PBS tanker has led to many operators come and view the vehicle, Simpson adds. "The industry is talking about it; it’s been followed now in Australia and there’s other people doing the combination." Simpsons have four vehicles: a Scania semi-trailer; two Isuzu rigid trucks; and the truck and quad. They plan to add another PBS vehicle to the collection next year and upgrade their fleet to Volvo, saying Volvo meets "every requirement" they’re after. "I think Volvo trucks are the safest in the world; with the technology and safety that they put into them our customers are impressed," Simpson says. Nestled between the Goulburn Valley Highway and Maroondah Highway some 26km west of Eildon, Alexandra is a sleepy little town with a population of less than 3000. 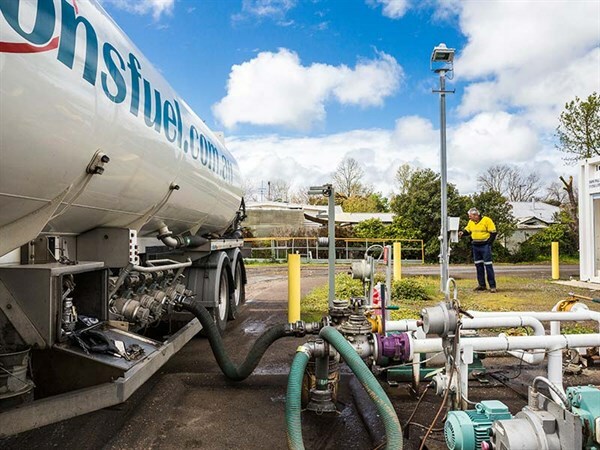 Being a major fuel distributor across three shires, Simpsons also supplies fuel to the local urban and rural communities, primary producers, government agencies, haulage companies, earthmoving contractors and timber harvesting operators. It regularly delivers to remote locations such as logging coupes and ski resorts, and by arrangement provides fuel 24 hours a day, seven days a week. "We are a small company but we’ve been here a long time and we love it," Simpson says. "We plan to keep on growing and within the next five years we hope to increase our business by a manageable amount." Currently in the process of purchasing a part of another fuel distributorship, the company expects to grow by 50 per cent over the next two years. "We will reach different customers in a bigger market area within Victoria, which means we have to become closer to the Melbourne market to grow our business closer to Melbourne." Simpsons carries some 20 million litres of fuel each year, with winters being quiet and summers busy. "When the price of fuel is up our retail part of business drops off a little bit, but all our industrial and logging customers probably use the same amount of fuel, and they’re a big part of our business." In 1985 it expanded into retail, with its major retail facility, service station and head office located at Alexandra. Selling oils and additives, Simpsons also offers after-hours diesel at Mansfield, which was opened six years ago and is mainly used by trucks and trades people. Being a regional fuel transporter means coming under scrutiny from fuel suppliers and customers alike. Therefore, Simpsons is an accredited member of TruckSafe. "We wanted to show to our customers that we excel in the transport industry and that we are as safe as we can be," Simpson says. "Joining TruckSafe was all about implementing best practice into the business and has brought a whole lot of things into our operation. "Through TruckSafe we use all accredited workshops and our drivers have become compliant with our measures; we have better working procedures now because of TruckSafe. "It’s become a national asset to our company and it’s good to get someone to come to our company and check us out and audit us and suggest better ways to make our company better. People see that you’re trying to lead and run TruckSafe vehicles, you’re trying your hardest to be safe and compliant." Being a small player in the national fuel market, Simpsons makes regular visits to other fuel distributors to learn from. "Even before we joined TruckSafe we went to Bonney Energy in Tasmania to have a look at how they comply with TruckSafe and what’s expected of us in the industry, so we’re always learning from other people in the transport industry," Simpson says. "Fuel industry is a competitive market but the people that are in it are willing to share how they do their process and how they do their maintenance. "We’ve got no hesitation ringing other distributors and say how do we do this and how can we improve our business – it’s a two-way street." Servicing Victoria’s alpine region means that one has to undertake regular driver training. "Prior to winter months every year we train our drivers in putting chains on trucks; we’re a bit unique as we have a dozen main customers in the snow region who only run on generators and if we don’t get there they stop," Simpson says. Simpsons’ injury rate stands at zero thanks to its drivers. "It all comes down to selecting the best of drivers – they’re all local and we know where they come from and their background. "In winter, if conditions are tough, we send two drivers per vehicle." Being a third-generation company, Simpsons has kept up with the times by staying proactive within the industry. It is a founding member and sponsor of the Alexandra Truck Road and Ute Show, and prides itself on customer relationships. "Because we’ve got a small base business, we know personally probably 90 per cent of our customers – we’re still a hands-on business that knows its customers," Simpson says. "Customers are everything to our business; if we don’t have them we haven’t got business. "A lot of these people in business I’ve grown up with, and now we’re servicing them and my children are servicing them." 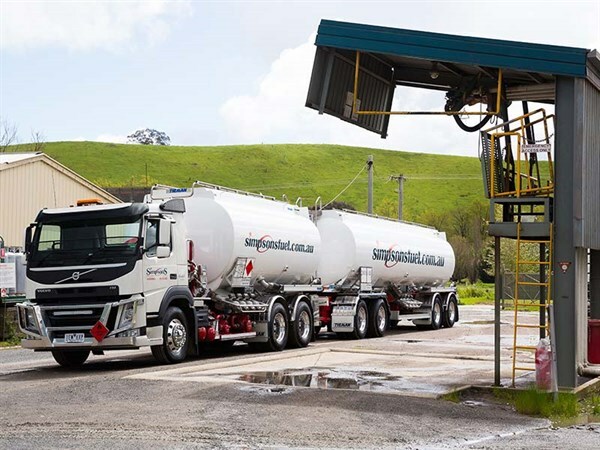 All of Simpsons’ trucks are GPS tracked and its IT systems are run by fuel and logistics software provider Queensland IT Group, which helps it oversee pick-up, delivery and fuel payments through mobile truck computing.